It is absolutely necessary that you understand how critical the first years of life are to your children’s development. Those early experiences have a huge impact on how their brains develop, influencing lifelong learning and general wellbeing. As a parent, it is your responsibility to closely observe how they play, act, move, speak, and learn every day. A development milestones table will help you keep track of their development. By regularly referring to one, you can more quickly and easily spot delays as well as precociousness. You expect your children to acquire new skills by a certain age. These are the milestones. Some of the ones typically achieved in the early years are running, spitting after brushing, potty-training, etc. Reaching these milestones early indication that your children are advanced compared with other kids their age. On the other hand, not reaching milestones or reaching them later may be an indication of a developmental delay. Not being able to do something by a certain age is a warning sign. When children don’t reach milestones in a timely manner, they’ll probably need extra help to achieve their full potential. It is important that you also realize that children develop at different paces. This is an advice for moms that is repeated over and over again. However, when children seem to be taking much too long to do something, you need to be proactive and consult your pediatrician. If the doctor echoes your concern, he or she will recommend the next step which is usually bringing your children to a developmental pediatrician. After a positive diagnosis of delay or disorder, you will get the proper prescription, which often involves early intervention. There are different aspects of your children’s development. The following areas are where they are typically monitored. • Spontaneously smiling, especially at other people. • Playing with other kids. • Showing affection for loved ones and friends without being prompted. • Pointing to show something interesting. • Crying when a parent or caregiver leaves. This involves the expression of needs, sharing of thoughts as well as the understanding of what’s communicated to them. • Babbling that eventually graduates to comprehensible speech. • Pointing to express what they want. • Singing songs from memory, usually nursery rhymes. This area involves thinking, learning, and problem-solving. This is the way kids will explore their surroundings to figure things out. They will look around, put stuff in their mouth, and drop things to the floor, all as a way of learning. They will also start acquiring academic skills such as learning numbers and the alphabet. • Finding ways to get an object they want. • Experiencing things by throwing, shaking, banging, etc. • Building towers of at least four blocks. • Learning how to get past obstacles. This involves children using their bodies for various functions. • Catching and throwing a ball. Some milestones pertain to different domains of development. For instance, pretend play would fall under both social or emotional and cognitive. Another example would be following instructions, which would belong to both language and cognitive. Many of them usually belong to the cognitive area as the acquisition of skills generally involves learning. 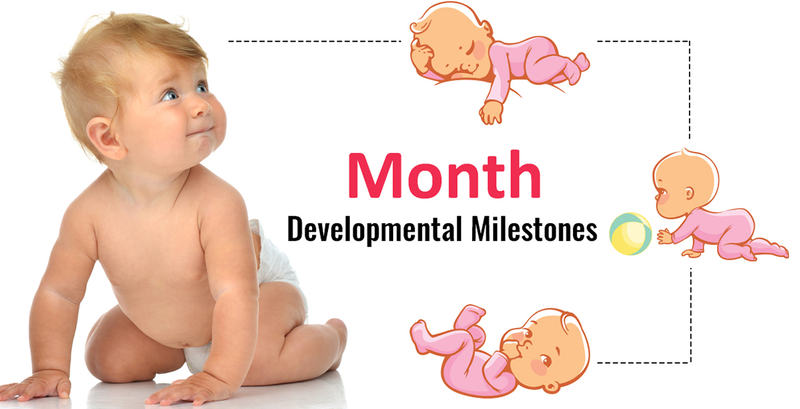 Essentially, these milestones help you understand your children’s development and behavior. Carefully keeping track of them, knowing when they’re supposed to happen, and watching out for them are all important parental responsibilities. Doing so will help you find out if development is on track and if a delay is being exhibited. Keep in mind that many delays can be helped by timely intervention. You will probably forever feel guilty if you end up missing a red flag. Ignorance is not likely an excuse you can live with.